There was a time that Heidi was an enthusiastic and cheerful student of mine. Sometimes she was so hard to contain! I remember finding her in the girls restroom when she was supposed to be in class. She was busy applying make-up and working on her hair. I suspect I was a bit exasperated when I said to her, "Heidi, this is not beauty school! Please go back to class". We smile about it now and she won't let me forget my words! It just so happened that she eventually did go to beauty school and is now using her enthusiasm and cheerful nature in service to others at her salon-station. How nice it is to see her again on a regular basis as I receive haircuts and manicures at the shop where she works. How pleased I was when I discovered that she worked at my stylist's shop! Heidi has always had a good heart. Her dedication to a cause can be seen by the fantastic results she gets. Her enthusiast nature simply pulls people in and teamwork is the natural result. Months ago Heidi became interested in the cause to eliminate breast cancer. She joined with many men and women by becoming a participant in the Breast Cancer 3-day Walk. These events are happening all over the United States. 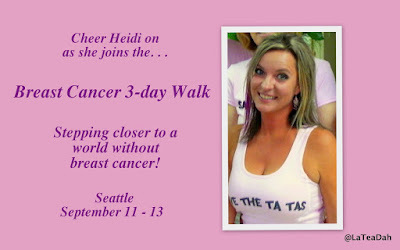 This week-end, Heidi is walking at the Seattle, Washington event. Dedicated conditioning and work-outs along with successful fund raising efforts have made her eligible for this role. Today she is walking the first of sixty miles. Tonight she will be camping out with others in a village of pink tents on their route. What a special young lady! Well done Heidi and good luck. Good to see that there is such a lot of support for things like breast cancer research, indeed any cancer research - I see far too many deaths in my community nursing from this awful disease. My hubby raised funds on his recent 100km cycle (see my blog post) for the Irish Cancer Society, and they got a huge response from the 3,500 cyclists.